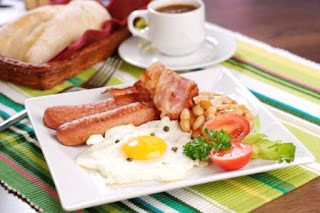 Many people trying to lose weight skip breakfast so they can save some calories. This is a big mistake. Blood sugar is the body's most powerful hunger signal. During sleep, your body uses much of the carbohydrate stored in the liver that help maintain healthy levels of blood sugar. If you skip breakfast, low blood sugar triggers the hunger center in your brain. The hunger signals can be so powerful that you overcompensate and eat too much at lunch, or snack for the rest of the day. University of Colorado researchers headed by Dr. Holly Wyatt, found that people who eat breakfast maintain weight loss better than those who don't. In the study, breakfast eaters burned up more calories during the day-probably because they had more energy. Eating breakfast-particularly if it contains some protein-can hold off the hunger monster for hours. Your body converts the amino acids from proteins into blood sugar. Aminos act as tiny blood sugar time-release capsules that can keep you from overeating.